Glory is the big girl at Geran's, standing at just under 25" at the shoulders. Glory is very solid with a deep body, and is a very pretty, plush bi-color. She has a very strong back, a good shoulder, and strong rear drive. Glory is heavily line-bred Andretti. 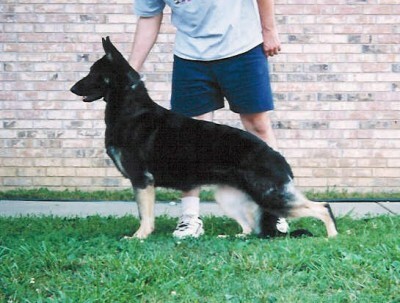 Glory has been bred to Group Winning AM CH Geran's All I Want For Christmas AKA ZAK. Litter is due mid October.